This Veterans Day, we salute those who have served our country. The Thresholds Veterans Project employs veterans who serve their peers, giving our Chicago-area veterans the care and resources they need to recover from mental illness, PTSD, and traumatic brain injury. Approximately 11% of the entire population in the United States are veterans experiencing homelessness. Of that population, 50% are also living with a serious mental illness, and 70% are struggling with a substance use disorder. Last year, they successfully provided 81% of clients with permanent housing. An estimated 70% of clients in the Veterans Project with a substance use disorder reported a “positive change in use” in the last 12 months. 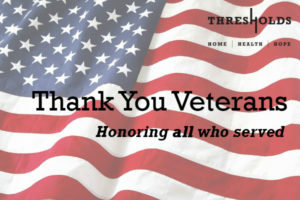 Thresholds is proud to serve more than 300 veterans through our Veterans Project – a number that continues to increase each year. We believe in serving those who have served us, and that everyone deserves to live their fullest lives, regardless of their past experiences; and we know that recovery is possible! After returning from the military, veteran Lisa* did not have anywhere to go. She was pregnant, living in her car, and living with a mental illness. As a survivor of sexual trauma, she was feeling lost and hopeless for her future. Then she found Thresholds. Within a week’s time, she became a client of the Thresholds Veterans Project, received the support she was missing, and a home of her very own. Lisa is now open to receive the recovery treatment and services she needs. As a senior veteran, Lisa was having a hard time managing her mental illness and substance use disorder on her own. Since coming to Thresholds, she has received supports such as housing, money management, medication education, and treatment services unique to her needs. She is a frequent participant in the Thresholds Veterans Project program and activities, and her quality of life has greatly improved. If you would like to financially support the Veterans Project, please visit our donation page. If you are a veteran from any war having a hard time coping with your mental illness, trauma, or issues such as homelessness, substance abuse, etc., please contact Fernando Valles, Director of the Veterans Project, at (773) 537-3154. This entry was posted in News and tagged chicago veterans, housing, mental health, ptsd, traumatic brain injury, Veteran's Day, veterans, vets. Bookmark the permalink.